How to Select the Best PTO Wood Chipper Shredder? If you’ve decided that you need a PTO wood chipper shredder, you’re either a lifestyle block owner, a farmer, or a professional contractor. 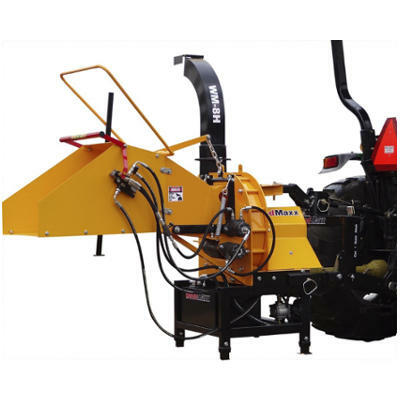 A PTO wood chipper shredder is a high-powered machine for tractors or excavators that requires the owner to have plenty of knowledge and experience with machinery. However, that doesn’t make the purchasing process any easier. Because there are so many 3-point wood chippers on the market, it can be difficult to know what the right one for you is. Does it need to be a mulcher and a tree shredder, all in one? Or does it need to chip consistent pieces for use in landscaping and gardening businesses? Within this buying guide, we list several top-rated models and brands of PTO wood chipper shredders, from various manufacturers. All fit into different price brackets and have different features. While it’s a hard task to know if you’re getting the best deal when you buy online or in-store, our product reviews below can certainly help. If you’re buying a PTO wood chipper shredder for an excavator or a tractor, you’re more than likely in need of something high-powered. But how much power do you need? In order to ensure you’re purchasing the correct machine for the job, you need to know the kind of work the tree shredder will need to do. Does it have to clear an entire forest block to supply a landscaping business? Does it need to be towed around your family farm to take care of the odd log or two? There are several different PTO wood chipper shredders on the market. Some are suitable for commercial or industrial use, whilst others are suitable for towing around the farm. Make sure you read through the features of each product to find out whether the machine you’ve got your eye on actually ticks all the boxes. If you’re an experienced tractor operator, you no doubt know just how dangerous PTO wood chipper shredders, can be. In fact, mulchers and tree shredders in general can be dangerous as well. Responsible for at least three deaths every year, it’s little wonder that safety features are common place on any PTO wood chipper shredder. However, these features can only help reduce injury, they can’t prevent it if you’re not operating the machine safely. Read the manufacturer’s manual to ensure you know how to operate a wood chipper safely. Wear safety gloves, goggles, boots, and a hard hat. Keep all limbs and your body away from the in-feed shoot. Don’t leave the chipper running unattended. Keep it balanced on even ground. Replace broken or damaged parts. While some brands are renowned for their low-quality machinery, often a lack of efficiency is down to the operator. When you’re looking for the best PTO wood chipper shredder for the money, you have to pay careful attention to the specifications. Many PTO 3-point attachments have an HP rating for a tractor or excavator, or have a log chipping capacity. If either of these specifications don’t match your current tractor or excavator, find one that does. PTO wood chipper shredders are very different in their appearance and features compared to a standard chipper. They are either built on a trailer, for a trailer or for a tractor hitch, and feature a 3-point plug to draw power from the tractor or excavator engine. They are large in size, heavy-duty, and are exceptionally powerful. Some have their own hydraulic components, whilst others use the tractor’s, or have none at all. They are a very convenient machine for many lifestyle block or farm owners looking to take the hard work out of tree removal. Because PTO wood chipper shredders generally don’t have their own power source, maintenance is often needed on the tractor or excavator rather than the chipper itself. Of course, you will still need to carry out basic maintenance to give your machine the best life span possible. Refer to your user guide, or read the few helpful tips included below as well. Check the rotor, twig-breaker, and blades for damage or stuck debris. Make sure the bearings are turning freely, lubricate them, and replace damaged ones. Make sure the guards are in the right place and are free from wear and tear. Check the feed hopper curtain to make sure it will protect you from flying chips. 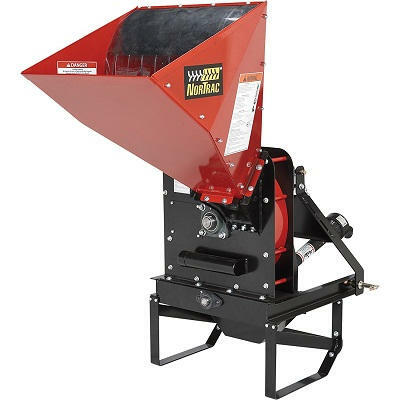 Finding a wood chipper shredder that’s affordable and of good quality can be tough. What might seem like the best deal could ultimately end up costing you more in the long run. People in the market for a PTO wood chipper shredder should look at the price tag in comparison to the features. If you’re not getting all the features you require, then it’s not the right machine for you. Even those in your price bracket may not be the right machine for the work type. It offers a variable speed hydraulic motor. It has a self-contained hydraulic system – separate from the tractor or excavator. The knives are made in the USA and are reversible. It’s very affordable considering its features. It’s powder-coated to reduce the risk of rust when stored in moist conditions. It’s slower than other chippers on the market. Some components are poorly made and rust easily. WoodMaxx PTO wood chipper shredder. Dimensions: 3 x 6 x 6.5 feet. QWhat is the minimum HP for this machine? QCan you adjust the chip size? ASlowing the machine down makes the chip size smaller, and speeding it up makes the chip size larger. For the cost of this machine, you get a lot of bang for your buck. Many farmers and lifestyle block owners will enjoy the convenience and overall power this PTO wood chipper shredder has to offer. It self-feeds, it has its own hydraulic components, and it can chip logs of 5-6 inches in diameter. While some parts are prone to rusting, the frame itself is powder-coated to ensure it stands the test of time. If you’ve got a tractor with more than 19HP, you will be impressed by what’s on offer. It’s one of the best PTO wood chipper shredders for the money. Check out what other people who purchased this product think about it. Read Wood Maxx PTO wood chipper shredder reviews. The hopper is vertically large so the logs require less pruning before chipping. It has an elevated discharge chute to fit a tub or wheelbarrow underneath to collect chips. The flywheel is powerful to chip all types of wood. It’s very affordable when you buy online. It can’t shred or mulch, it can only chip. It struggles to self-feed if there are lots of twigs and leaves attached to the logs. It doesn’t have hydraulic feed. 2-year warranty or 90-day commercial warranty. Dimensions: 54 x 34 x 60 inches. Chipping Capacity: 5 ½ inches thick. Warranty: 2-year warranty or 90-day commercial warranty. QWhat HP must the tractor or excavator have? QHow do you transport it? AThe tractor’s 3-point hitch lifts it up. QCan this machine shred as well as chip? Whether you’re a professional or a lifestyle block owner, as long as you have a tractor you are sure to benefit from this NoTrac wood chipper. It can cater to all operators with tractors over 20HP, and chips all kinds of wood with ease. It even has a larger chute in order to cut down on pruning time. This machine is also very affordable on the market, and is low-maintenance. However, it doesn’t have wheels. Therefore, it must be transported using the tractor’s 3-point hitch. It also can’t be used as a mulcher or a tree shredder. It’s purely for chipping wood. If a chipper is all you need though, the NorTrac ticks all the boxes and would make a great asset to your farm or place of business. Check out what other people who purchased this product think about it. Read NorTrac PTO wood chipper shredder reviews. It’s one of the most affordable PTO wood chipper shredders on the market. It’s lightweight so that it can be used for smaller tractors. It has blower paddles to break twigs which saves on pruning time. It has air intake vents to maximize the airflow from the exhaust. The cutting blades are angled in order to pull branches into the chipper. It has a very generous warranty for both commercial and non-commercial use. It’s not suitable for larger, more powerful tractors. The chipping process can be slower than several other models. Farmer Helper wood chipper shredder. 3-year warranty, 1-year commercial warranty. Dimensions: 38 x 46 x 42 inches. Warranty: 3-year warranty, 1-year commercial warranty. QWhat type of connection does it need? QWhat is the PTO speed? QWill it work on a 60HP tractor, even though it’s rated to up to 25HP? AYes, but you will need to shim it to your cat 2 pins. For its price tag, you would expect this Farmer Helper to run less efficiently than it does. Priced at around $500 cheaper than other models, it really does meet the mark as a durable, reliable, and cost-effective chipping option. It’s suitable for a range of tractors and comes with a far better commercial warranty than most other manufacturers. The only negative is that its log capacity is around one inch less than other models. Check out what other people who purchased this product think about it. 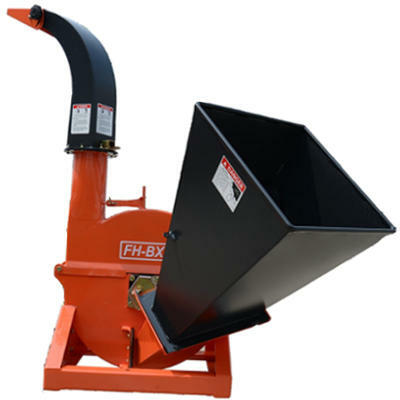 Read Farmer Helper BX42 PTO wood chipper shredder reviews. It’s very powerful and has a category 4 PTO driveline. It has a 6-belt drive system for extra power. It’s suitable for tractors between 30-50HP. It can chip logs of six inches in diameter. It has a poor warranty in comparison to its price. Dimensions: 38 x 37 x 62 inches. QWhat kind of drive system does it have? QWhat kind of hitch does it suit? AYes it has a belt-driven feed roller. For a large farming or contracting operation, this PGF chipper is a good option. However, it’s hard to know whether you’re getting good value for your money. It appears to have all the same features as far less expensive units, and is just as portable as well. Its only reason for the $4000 price increase in comparison to other brands is the ability to be used on tractors with higher HP. Although this is convenient, the maths doesn’t add up. However, price aside, this machine does what it says it does, and does it well. It self-feeds through the belt-driven roller, and even chips with precision and speed. It’s not the most well-priced machine, but it’s top-rated and could be a preferred option by many. Check out what other people who purchased this product think about it. Read PGF WCP600 PTO wood chipper shredder reviews. The blades are reversible to make maintenance cheaper. It has twig breaker paddles to reduce the risk of clogging. The feed chute is hinged to make storage and transport a breeze. It’s very affordable on the market. For its price, its log-chipping capacity is quite poor. It can jam with too many twigs and leaves. The input chute is very narrow. Gravity feeding can be very labor-intensive. Titan Attachments wood chipper shredder. Dimensions: 40 x 42 x 60 inches. Engine Capacity: Up to 40HP. QWhat is its operational RPM? QDoes it come with the PTO shaft? QDoes it have an automatic feed unit? ANo, but it grabs logs with ease. While it has a few teething issues, this Titan Attachments wood chipper shredder is a reliable piece of machinery. It’s suitable for lifestyle block owners or professionals, and it’s intended for use on tractors with up to 40HP of power. While it’s efficient at chipping logs, it does have its limitations. The feed chute is small, so the 4-inch log capacity can end up being more like 3-3.5 inches. It also has some poorly-made components which need regular adjustment. It’s affordable on the market, but it’s certainly not the best PTO wood chipper shredder for the money. Check out what other people who purchased this product think about it. Read Titan Attachments BX42 PTO wood chipper shredder reviews. Where to Buy PTO Wood Chipper Shredders? Gone are the days when consumers were limited in their purchasing decision by the stores they had around them. We now have a far more convenient platform – the internet. Websites such as Amazon are a treasure trove for 3-point wood chippers, shredders, mulchers, and all kinds of outdoor equipment. Whether you’re a professional or a homeowner, you are sure to find a machine to suit your needs at the right price for sale online.